One of the world’s deadliest mushrooms could save lives, thanks to work being done at the University of British Columbia. The death cap mushroom, known scientifically as Amanita phalloides, causes liver failure and grows in the Greater Victoria area. The toxic mushrooms have been spotted earlier than usual this year, in the Uplands and Cedar Hill neighbourhoods, prompting warnings from Island Health. In 2016, a three-year-old boy died after eating a death cap mushroom his family had foraged in downtown Victoria. David Perrin, a UBC chemist, has had a breakthrough in his efforts to use that same deadly mushroom to cure cancer. “That’s our goal, nothing short of that,” Perrin said Tuesday. He said the death cap mushroom is about 100 times more poisonous than cyanide which, from a scientific point of view, he found fascinating. About a decade ago, Perrin started looking at other scientists’ work with the death cap mushroom. He saw the toxin’s potential to kill cancer cells but realized a critical element was missing. 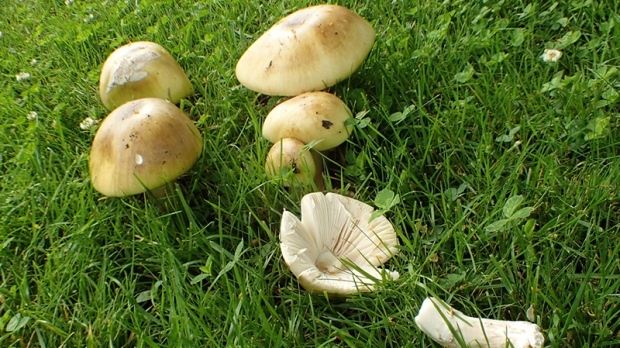 Scientists were only able to use the toxins from actual mushrooms, which only grow in certain areas and are seasonal. When a toxin is natural, it can’t be controlled, so Perrin set out to create synthetic version. “To be able to master its synthesis means to make toxins that are going to be hopefully super toxic to cancer cells and less toxic to liver,” he said. But it has been a long, tedious road of trial and error. “This is backbreaking work. My students are in here nights and weekends, taking failure, staring right down in its eyes,” he said. Kaveh Matinkhoo is one of the students who has been working in the lab. “We lost hope so many times, just going at it,” he said. Now he is part of a success story. The team worked and reworked the chemistry, and finally figured out the elusive formula to synthesize the death cap mushroom’s toxin. “This can possibly provide a new, efficient treatment for a lot of cancers. For sure it was worth the time, effort, all the troubles and all the failures. It’s very exciting to be on a project like this,” said Matinkhoo. Now that they can make a synthetic version, Perrin and his students will work to make the toxin less harmful to the liver and get it to latch onto certain antibodies. “When people know how to do this, those antibodies will target the cancer, they will physically take the toxin to where the cancer is,” he said. Perrin’s excitement about being so close to a cure for cancer is palpable.